I wonder if flowers could talk or had human emotion or ability to reason, would they dwell in prejudice against the color of another flower? 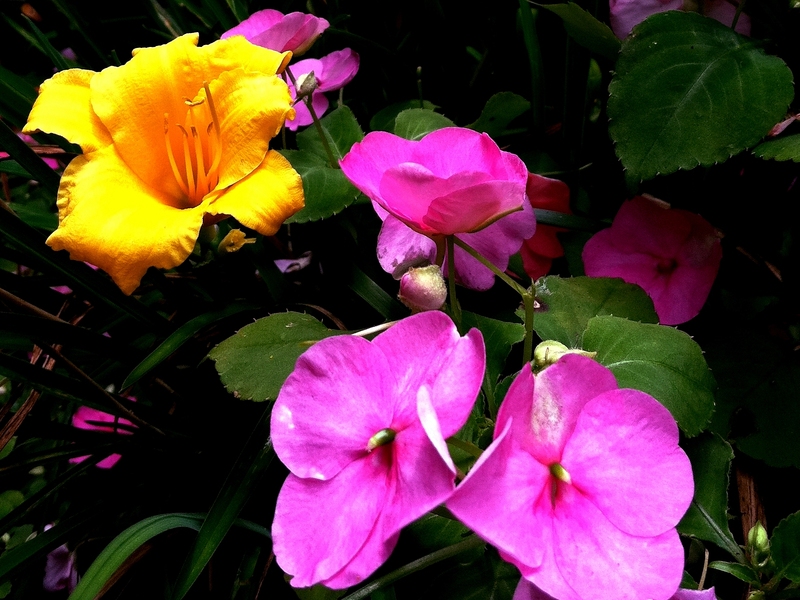 Would they judge and resent, even hate one another because of the color of their petals? And not just the color differences, but the different varieties? 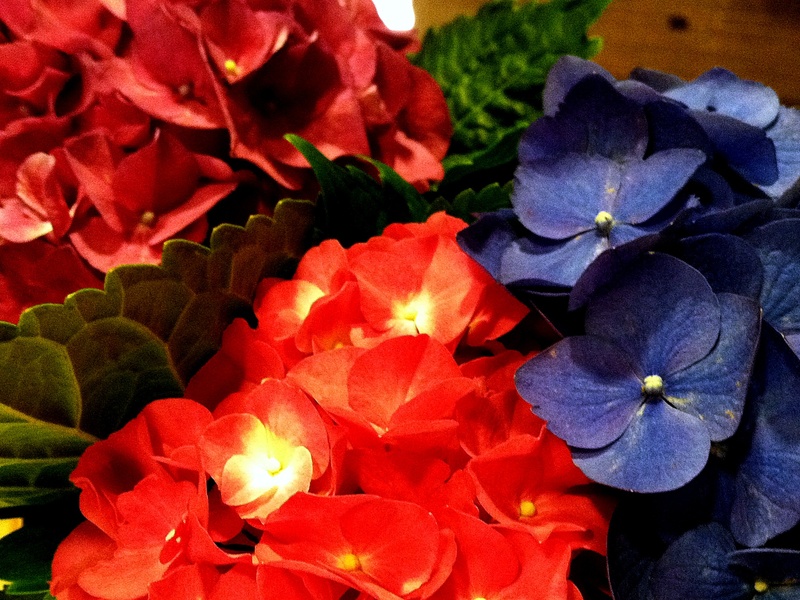 The hydrangea colors are dependent on soil acidity. The daisies in the photo above have colors that are man-induced. They were “created”. Not the flowers, of course, but the colors. Why did someone do this? Doesn’t it add to their brilliance, bring a smile, and increase joy? They shout “fun”! Aren’t we awestruck and delighted by the very nature of their differences? Their color and composition is completely at the mercy of their maker. They cannot help what color they are. But do we complain? Do we harbor resentment because of the multitude of color? Then why do we do this with humanity? It is the stuff of war and crime throughout history and all of us know it is wrong. Yet, hard as we try, we can all find traces of it lurking deep inside. It is our greatest stain deep within—racism. But how did it happen? My instinctual guess is it was taught and modeled before us. In my own observations it seems children are not born racist. When they are young, watch how they play. I marvel at how they play happily with one another, all strangers, all different skin colors. It is a delight to watch, my five-year-old grandson mixing right in. But as we grow up things change. And we have a big problem. So why don’t we just admit it? In problem solving, isn’t that what we’re taught? To first admit we have a problem? My own resolve is to look beyond skin into the soul. The soul which is a human heart with a universal need of empathy and love. A soul which needs to be heard. Think of last summer’s Olympics. For a wondrous moment every nation was at peace. 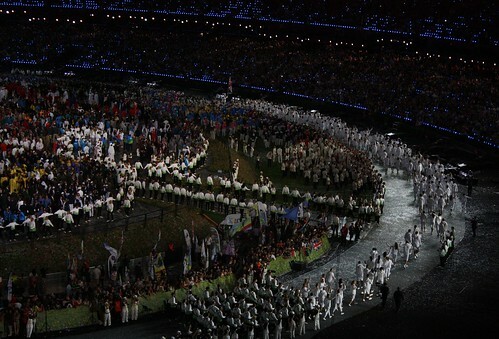 We watched the very best athletes parade into the stadium and what a sight it was! Did it not take your breath away to see the vast array of different cultures, different colors both in costume and skin? Did any of us have a racist or prejudiced bone in our body during those wondrous seventeen days? As a believer in God, I theorize the Creator’s original intent may have been what we witnessed at the Olympics. Why else would He be so risky as to create his image-bearers in different colors? He obviously loves lots of color. Why not color us, too! He created everything and said, “It was good.” And that’s exactly what my different skin color friends have done for me—enriched my life and thinking. It is good—very, very good. So if nature and children teach us to delight in the of the myriad of color, can we not strive to do the same? After all, it’s all just a matter of a mere .012% melanin. “One race, many ethnicities.” ~ S. Michael, aka my son. Thank you for the comments. Wow, I need to add your quote about the garden! May I? WELL SAID!!! AND BEAUTIFUL PICTURES!! Weekly Photo Challenge: Color. | the unbearable lightness of being me.